Virgilius was a scientist before his time, and in his monastery of Aghaboe in Ireland he was known as "the Geometer" because of his knowledge of geography. In 743, he left Ireland for a pilgrimage to the Holy Land but got no farther than the court of Pepin, the father of Charlemagne. 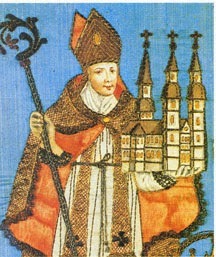 In 745, Pepin defeated Odilo, duke of Bavaria, and sent St. Virgilius to be abbot of the monastery of Sankt Peter and in charge of the diocese of Salzburg. In accordance with the Irish custom, the bishop was subject to the abbot, who was the real head of the diocese. This was contrary to continental custom, and so Virgilius consented to be consecrated bishop. His most notable accomplishment was the conversion of the Alpine Slavs; moreover, he sent missionaries into Hungary. In his first days at Salzburg, he was involved in controversies with St. Boniface, one over the form of baptism, which the pope decided in Virgilius's favor. Virgilius also expressed a number of opinions on astronomy, geography, and anthropology, which to Boniface smacked of novelty, if not heresy. He reported these views to Rome, and the pope demanded an investigation of the bishop of Salzburg. Nothing came of this and apparently Virgilius was able to defend his views. Virgilius built a grand cathedral at Salzburg, baptized the Slavic dukes of Carinthia, and sent missionaries into lands where no missionary had yet gone. Returning from a preaching mission to a distant part of his diocese, he fell sick and died on November 27, 784. When the Salzburg cathedral was destroyed by a fire in 1181, the grave of Virgilius was discovered and this led to his canonization by Pope Gregory IX in 1233. His feast is kept throughout Ireland and in the diocese of Salzburg.